As I have already told you in the “about the artist ” section of this website, my starting point or main reference I had was the painter Pere Torné-Esquius (Barcelona 1879-Flavancourt 1936). that had decorated a child´s room. They were exhibited in the fine-art gallery Sala Parés in Barcelona at the end of 2006. 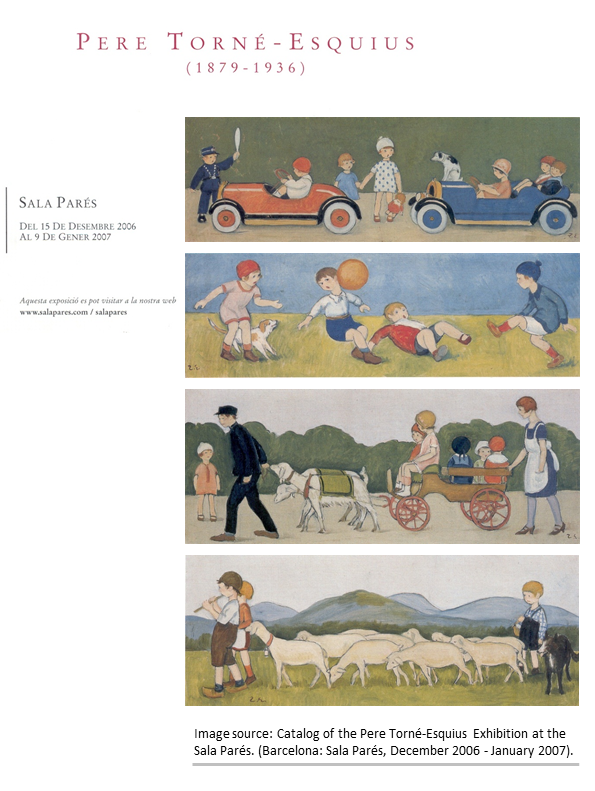 I have chosen some of them from the catalog of the exhibition to show them to you. 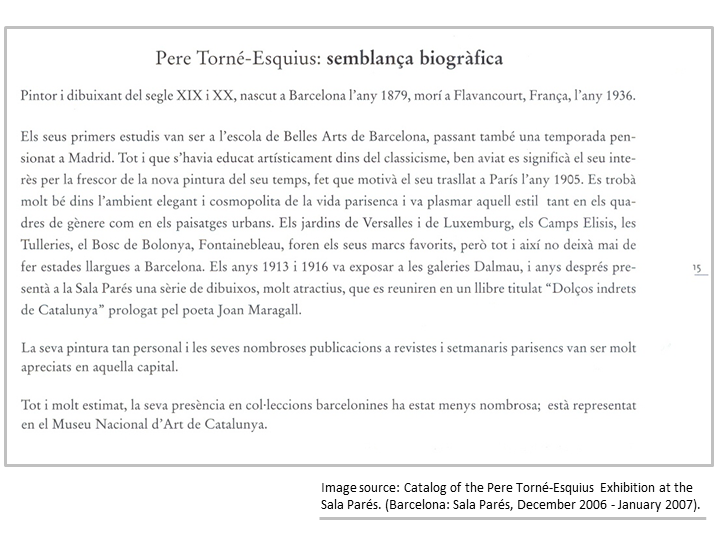 The catalogue of the gallery Sala Parés provided the Pere Torné-Esquius biograpghy. 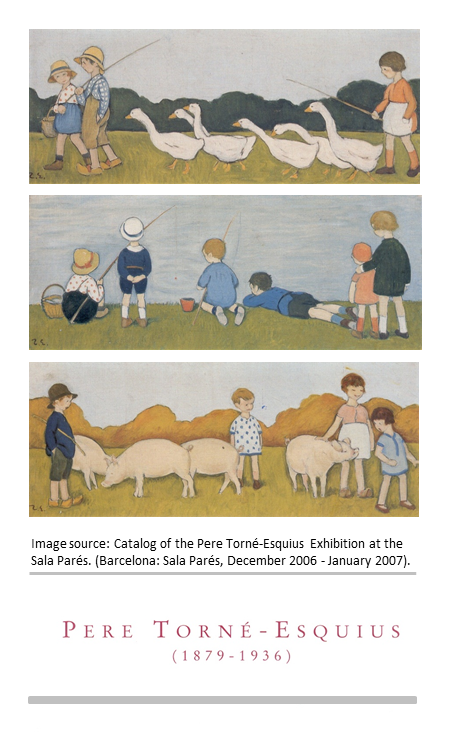 Below you can find the original text that had been published in the exhibition catalogue, and then you can find a translated script (Catalan to English translation) which summarizes the painter´s life already detailed in the catalogue of the Sala Parés. Painter and draftsman of the XIXth and XXth Century. (Barcelona 1879-Flavancourt 1936). He studied at the Escola de Belles Arts de Barcelona and he spent some time in Madrid, too. Although his art education was according the classicism standards, he was soon interested in the new painting styles emerging and for this reason he moved to Paris in 1905. The artist soon felt comfortable in the elegant and cosmopolitan Paris atmosphere, and this was reflected not only in his genre paintings but also in his city landscapes ones. Although his favourite places or settings were in France, he never avoided extended stays in Barcelona. His personal painting style and also his many illustrations in magazines and weekly publications were highly appreciated in the French capital. Although being a highly appreciated painter in Barcelona, his works are not included in many of the city collections. However, he is represented in Barcelona in the MNAC collection.